Cracker Jack ALPHABET ANIMALS were made by the National Organ Supply Company (NOSCO) and first introduced in 1953 as Cracker Jack ID #1179. According to Alex Jaramillo, in The Prize Collectors Journal , this was the sixth series of plastic stand-up prizes that NOSCO's Plastics Division made for Cracker Jack. As with other NOSCO series, ALPHABET ANIMALS had a successful run, and the prizes were reordered by The Cracker Jack Company again and again -- probably accounting for the existance of the two types of NOSCO ALPHABET ANIMALS. Literally millions of these were made. They were not only found in boxes of Cracker Jack, but could also be purchased from mail-order retailers advertising through print media -- accounting for finds in recent years of groups of 60, 80, or 100 Type II ALPHABET ANIMALS at a time. A very popular series in the 1950s, Cracker Jack lovers could find each of the ALPHABET ANIMALS in every color of the rainbow -- and even some colors not found in a rainbow. 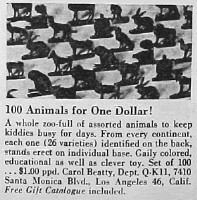 IN THE PHOTO AT RIGHT: This Carol Beatty -- of 7410 Santa Monica Blvd., Los Angeles 46, Calif. -- mail order ad shows NOSCO ALPHABET ANIMALS as they were sold by catalog in the 1950s. Wouldn't it be great to buy 100 for a dollar today? Another company that sold NOSCO prizes by mail order was Breck's of Boston -- 729 Breck Bldg., Boston 10, Mass. ALPHABET ANIMALS come in an endless array of colors, tints, and shades. The most common colors are red, yellow, green, cobalt blue, ivory, and white. Click HERE for more information on the colors in which NOSCO ALPHABET ANIMALS were produced. Most Cracker Jack collectors have no trouble assembling a set of ALPHABET ANIMALS in mixed colors. Because they are fairly common, ALPHABET ANIMALS have not previously been seriously studied. I am collecting information to determine letter and color distributions of ALPHABET ANIMALS. I am also interested in collecting all the ones I don't have yet -- which might be, well, thousands! If you consider all of the color possibilities, you can see why this set provides me with endless hours of collecting fun. Have fun, and happy collecting!